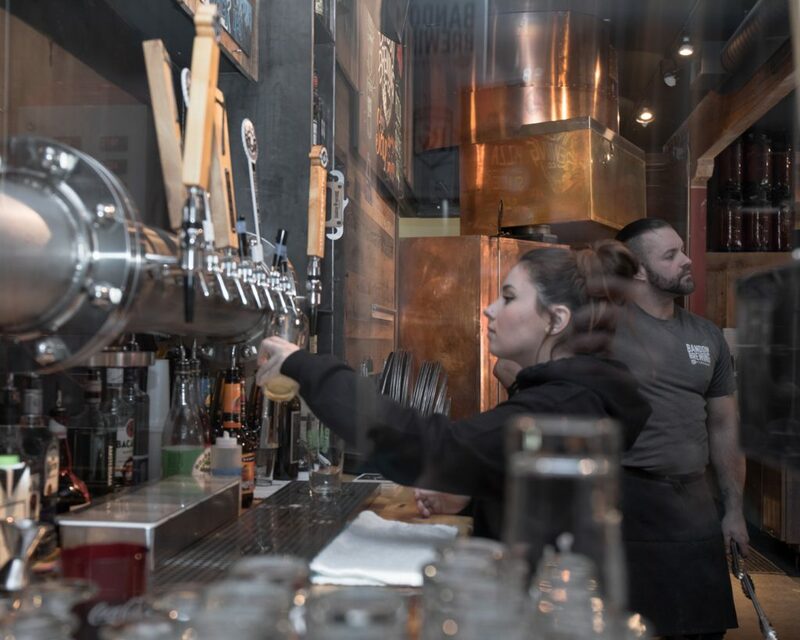 At Bandon Brewing Company & Pizzeria, families duck in for a relaxed meal. Local professionals grab a booth for a working lunch. Reclaimed wood paneling and surfing decor on the walls sync with Bandon’s rural, seaside vibe. 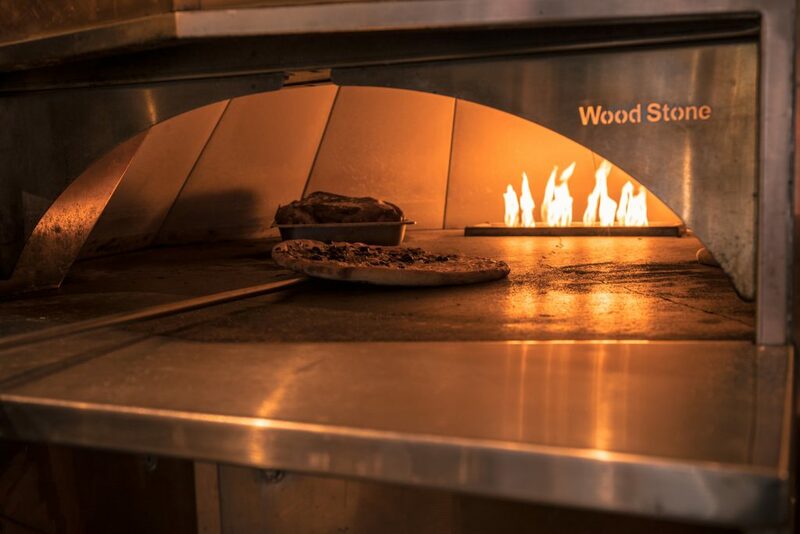 An open flame stone oven anchors the space– you can watch your meal cooking. The west wall of the brewery is lined with steel tanks. Owner/brewer Jonathan Hawkins is filling kegs, keeping an eye on the pressure gauge. He likes having a business that keeps him moving. Even the clean-up has its merits. But, running a restaurant and brewery requires a lot of multitasking. A couple of brewers from Curry County stop on their way up the coast to grab a slice of pizza and check in with Hawkins. They talk shop, share notes about the best PSI from tank to keg to tap. Hawkins invites his colleagues to sample his latest brew. He’s considering a different yeast for the recipe, and he welcomes feedback. Brewers are among the most open-source and collaborative professionals to work with, Hawkins says. Yeast is the one ingredient brewers tend to keep secret. There’s no secret to Hawkins’ vision for the business. 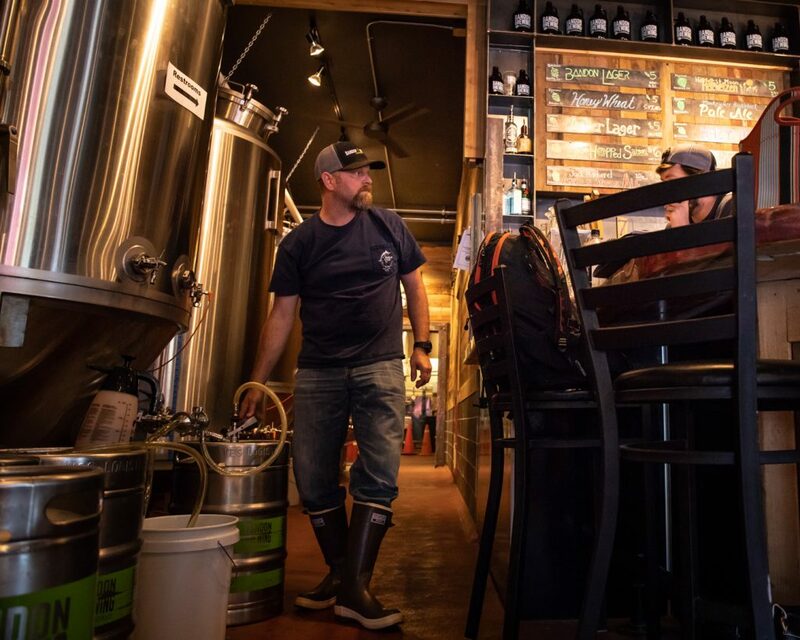 He sees Bandon Brewing Company as a community hub, a place for good food, good local beer and good company. 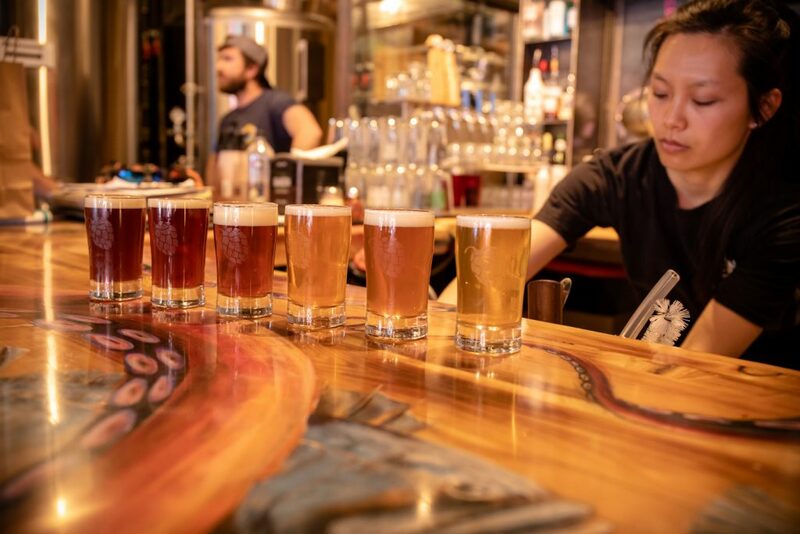 The tap menu features Bandon Brewing 1 Eyed Jack IPA, Rio Red Ale and Bandon Lager, plus additional ales, lagers and seasonal selection. Hawkins keeps a couple of taps available for other Oregon microbrews along with Bandon Rain Hard Cider. Guests can order in a variety of sizes, from a four-ounce flight glass to pitcher or growler. The kitchen crew preps fresh batches of hummus, pizza sauces and crust. (The pizza dough proofs for a day before it’s hand-tossed and baked.) The pizza menu offers classic and build-your-own selections. Diners can also order appetizers, soup, salad, sandwiches and burgers. Hawkins and his wife, Doctor Nicole Rush, negotiated the purchase of the Old Town McNair building in 2015. Their initial intent was to remodel a portion of the building for an expansion of Rush’s optometry practice with Bandon Vision Center. 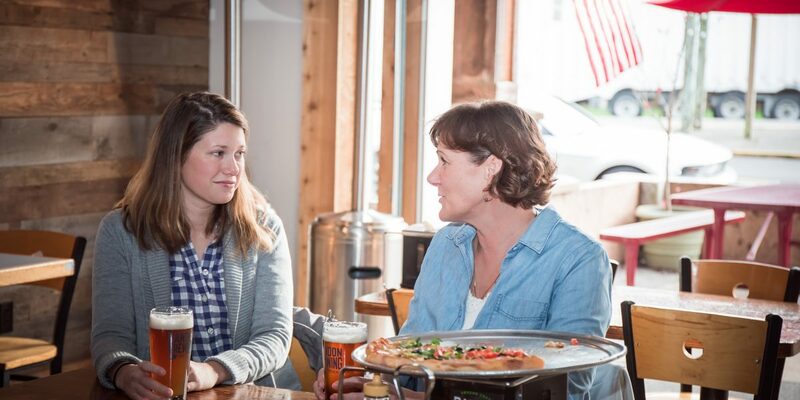 Not long after, the couple purchased the existing pizza business and launched Bandon Brewing Co. in 2017. Hawkins has worked as a general contractor for years. He owned and operated the Lake Quinault Resort in Washington for nine years before moving to Bandon. His brew making experience was limited to some home-brew projects with friends. So he took advantage of training offered by Charlie Johnson at the Portland Kettleworks Labrewatory. 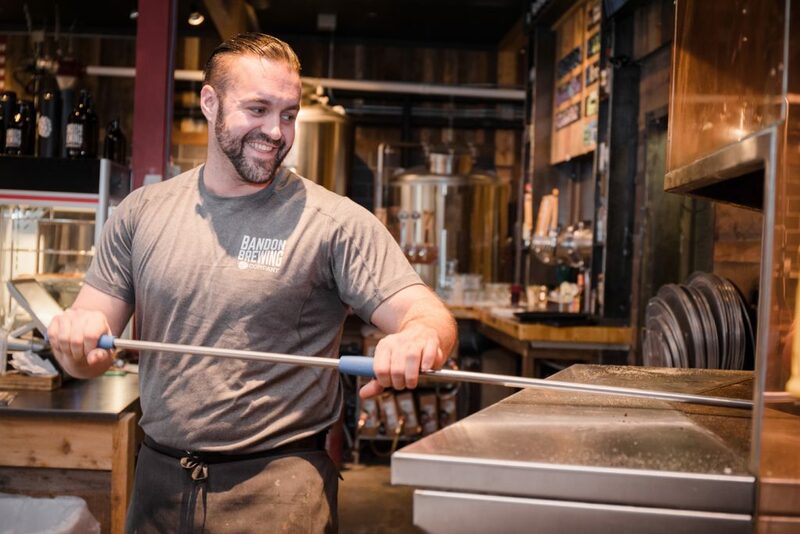 And, he recruited brewmaster James Petti, (who’s now full time with the Labrewatory), to help create the first Bandon Brewing recipes. While the vision center remodel is underway, locals and visitors line up to order pizza and beer. Hawkins and Rush are eager to explore new options for community involvement, supporting projects such as the Whiskey Run Bike Festival and Gorse Blossom Festival. “We’re looking for creative ways to give back to the community that’s embraced Bandon Brewing Company,” said Hawkins. Bandon Brewing Company & Pizzeria is at 395 Second St. SE in Bandon, open daily for lunch and dinner, starting at 11 a.m. Article and photos by Geneva Miller.